"Bringing The Party To Your Event"
Been let down? Need a last minute DJ? Or planning a wedding, corporate event or party? Whether an intimate family get together or a grand evening ball, DJ VAiN has the experience and the musical knowledge to entertain you, and your guests, from start to finish. I am based in Leigh (Greater Manchester) and I look forward to helping make your event a night to remember. Don't delay - book today. I am a professional, reliable and experienced DJ who can provide you with a high quality nights entertainment for your event, comfortable working with music from the 50s to present day to suit all occasions. I am happy to work with all genres and can provide themed nights on request such as Motown/soul, 70s, 80s, 90s and club style nights. - large PA system, lighting rig and video/karaoke available. All bookings include access to an online event planner & song list selector for the event organisers, and a professional service from a fully equipped DJ. Required by many venues, VAiN Entertainment - DJ VAiN has not provided satisfactory evidence of having current PLI available. Also required by many venues, VAiN Entertainment - DJ VAiN has not provided satisfactory evidence of having current PAT records available. A Method Statement outlining VAiN Entertainment - DJ VAiN&apos;s Health & Safety procedure for setting up disco equipment has been provided. Why do people choose to book VAiN Entertainment - DJ VAiN? "I booked vain entertainment with only a few days to go,i i got a very good price to say it was last minute and would like to thank keith(the dj) for makin my mrs 30th a perfect night.will e keeping his number for future events and would reccomend to all famly and friends andanyody who is looking to book.he was excellent in dealing with song requests from not just adults but also the children who attended.overall a very good dj,thank you." "Thank you very much for a great review, im glad I could step in at the last minute and deliver a party you were so happy with"
"Despite adverse weather conditions (heavy snow) Keith arrived on-time and didn't leave until just about everyone else had. His playlist was exactly what I asked for and he responded very positively to various random requests from guests, including a Karaoke interlude! I would have no hesitation in recommending Keith's services - he really made the night for us all." 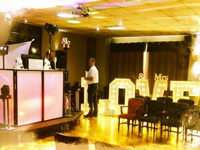 "Thank you very much for your feedback, it was fantastic to dig through some of the Motown classics to keep you dancing the night away"
VAiN Entertainment - DJ VAiN also offers a range of additional party services not directly linked to musical entertainment. If you are contacting VAiN Entertainment - DJ VAiN about an event, it's always a good idea to include the DATE, LOCATION, EVENT TYPE, AGE GROUP and TIMINGS to speed things up!